KUALA LUMPUR, October 31, 2018 - Universiti Sains Islam Malaysia (USIM) International Staff Attachment Program for Regional Governor Mujiv Hataman, Autonomous Region in Muslim Mindanao (ARMM) and Team has included a 3-day (October 29 - 31) intensive study tour to International Islamic University Malaysia (IIUM) Gombak Campus and Kuala Lumpur Campus respectively. This arrangement was made possible with the good office of Emeritus Professor Tan Sri Dato' Dzulkifli Abdul Razak, Rectorof IIUM who is the Founding Converner of Sejahtera Leadership Initiative (SLI) and the Former Chairperson of USIM. International Institute for Muslim Unity (ILMU). Kulliyyah of Information and Communication Technology (KICT); Distinguished Professor Datuk Dr. Osman bin Bakar, Shaikh al-Kulliyyah & Chair holder of al-Ghazali Chair, International Institute of Islamic Civilization and Malay World (ISTAC) and Professor Dr. Thameem Ushama, Dean of ISTAC. Day-3, Professor Dr. Hamzah bin Mohd Salleh, Dean of International Institute for Halal Research and Training (INHART); Professor Dr. Mohamed Aslam bin Mohamed Haneef, Director, Centre for Islamic Economics, Kulliyyah of Economics and Manageent Sciences (KENMS); and Br. Mohd. Razif bin Mamat, Covering Director of IIUM Endownment Fund. Special thanks must be mentioned to the Event Chief Organizer of this Study Tour, Professor Dr. Isarji Haji Sarudin, IIUM Deputy Rector (Academic & Industrial Linkages) and his team: Br. Tuan Anuzi; Dr. Siti Zubaidah Anuar and Br. Wahab Zawawi. The last few years have seen milestones in USIM - IIUM relations with ARMM, notabaly the exchange of high-level visits in 2016 and 2017 between Regional Governor Hataman and Emeritus Professor Tan Sri Dzulkifli and the breakthroughs in Sejahtera training programs. These developments underscore the enduring friendship between the three universities i.e. USIM, IIUM and Mindanao State University (MSU) System and ARMM in two neighbouring countries namely, Malaysia and the Philippines which are the ASEAN Founding Members. 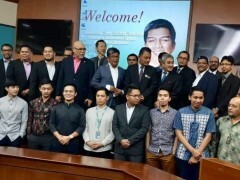 Remarkably, this partnership has been given a significant boost and a timely signing the Letter of Intent (LOI) between IIUM and ARMM which will be followed between USIM and ARMM accordingly. It is highly commendable to record their initiatives in putting together this compendium of multilateral programs, a "best practice" in research and development (R&D), exchange programs, education, training, consultancy and Sejahtera development. With this LOI, a joint working group to review its implementation need to be established. inclusive and progressive ASEAN. We need to strengthen and broaden co-operation in the new narrative that is beyond SDGs." In response, Honorable Mujiv Hataman said, "As Regional Governor in the past 6 years and under the guidance of President Duterte, I've worked with various Departments and other stakeholders in Kuala Lumpur and Manila for Mindanao Peace Process. I can feel that the hearts of Malaysians beat like that of the Bangsamoro because our two peoples share much in culture, religion, values, heritage and in our aspirations for peace. Yes, together we can nurture and enhance this partnership by opening new chapters in win-win relations built on trust and shared commitment that mutually beneficial economic growth and sustainable human development."